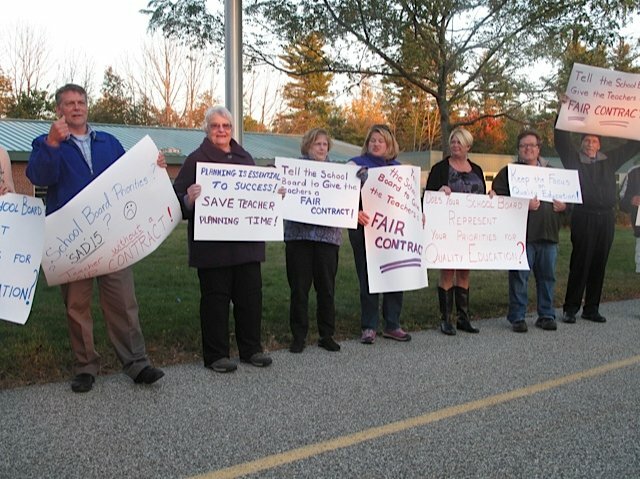 NEW GLOUCESTER — A line of three dozen RSU 15 teachers bearing picket signs protesting having to work without a contract flanked the front of Memorial School on Monday to greet residents attending the first of three community forums by the school board on an upcoming $7.36 million referendum vote. 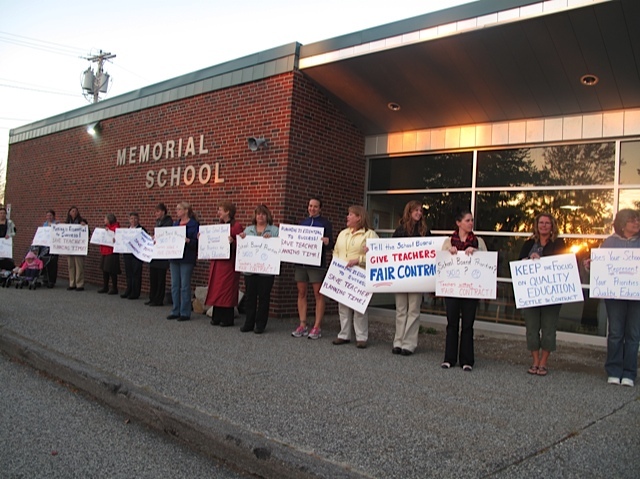 The 11-member school board planned the meeting. Gray and New Gloucester voters on Nov. 4 will be asked to approve a 25-year bond of $7.36 million to renovate the high school chemistry labs and build an addition to Gray-New Gloucester Middle School, where the parking lot will be expanded and the building repaired. The bond would also be used to expand and develop a sports complex for the high school and middle school. About $738,000 of the total bond amount would also be used to install artificial turf in place of grass when making high school stadium field improvements. That component of the bond proposal will be voted on separately if the vote on the larger project passes. New Gloucester resident Michael Brakey questioned the safety of an artificial turf field, which relies on new technology to reduce injuries. If approved, the turf carpet would need to be replaced in about 10 years, costing roughly $250,000. The replacement would need to be done twice during the bond period. Resident Peter Bragdon learned that the new artificial turf technology allows treatment for bacteria. School board member Glenn Mercier of New Gloucester said the town has a fabulous, flat, playing field with potential at the New Gloucester Fairgrounds, but funding support from the town is lacking. The public faulted the board for not waiting longer for the community to understand the impact of the bond request so close to issuance of the town’s recent tax bills, which reflect more than a 10 percent increase for schools this year. Resident Beverly Cadigan said the school board failed to heed the citizens’ request to separate the bond into three articles: buildings, sports complex and artificial turf. “We were told there was insufficient time, but several days later, the board changed it into schools with fields at $6.2 million and separate artificial turf at $738,000,” she said. Sean Chayer of New Gloucester said the school board was secretive. “You should have come (to us) more often and sent out newsletters,” he said. “You have lost any trust I had for you,” said Steve Hathorne of New Gloucester. Peter Pinkerton, a former Gray school board member, said he was part of the $10.3 million successful bond vote to renovate district schools. The district will retire a long-term bond in 2017-18. The new bond, if passed, will start as bond anticipation notes for two years while construction takes place. The district’s next bond to be retired falls in 2027-28. Superintendent Bruce Beasley said the district wanted to begin the project now with favorable interest rates and reduce the period before the fields will be operational. Grass fields take two years to mature before they can be used. Turf may be used immediately. The tax impact of debt service on the proposed bond for a $200,000 home in New Gloucester is projected to be $25.52 in 2017-18 and $55.81 in 2019-20. The impact to a Gray home is $28.41 in 2017-18 and $61.91 in 2019-20.